Metarecords are compilations of individual bibliographic records that represent the same work. This compilation allows for several records to be represented on a single line on the TPAC search results page, which can help to reduce result duplications. Selecting the Group Formats and Editions checkbox on the Advanced Search page allows the user to perform a metarecord search. Administrators can also configure the catalog to default to a Group Formats and Editions search by enabling the relevant config.tt2 setting on the server. Setting this option will pre-select the checkbox on the Advanced Search and Search Result Pages. Users can remove the checkmark, but new searches will revert to the default search behavior. 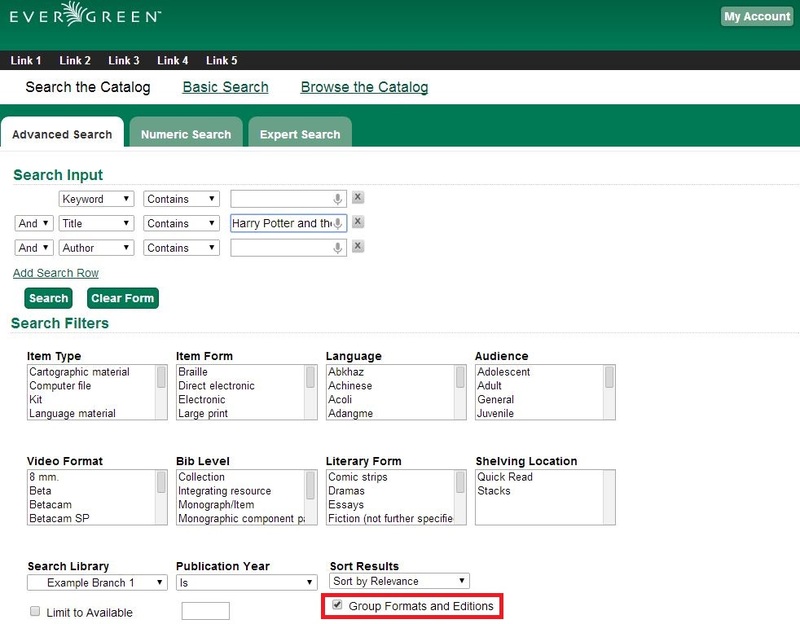 Within the Search Results page, users can also refine their searches and filter on metarecord search results by selecting the Group Formats and Editions checkbox. 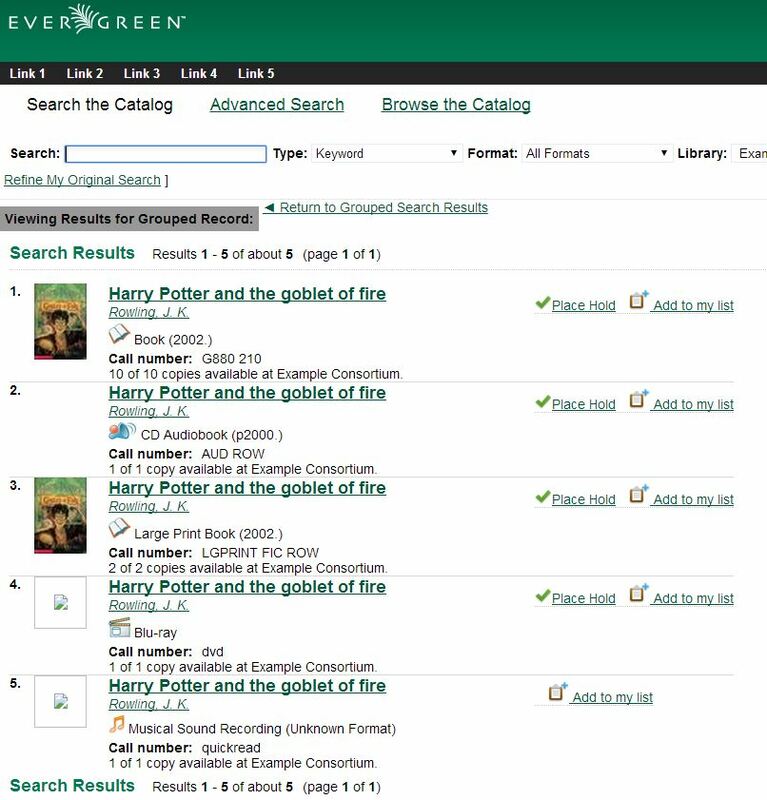 The metarecord search results will display both the representative metarecord bibliographic data and the combined metarecord holdings data (if the holdings data is OPAC visible). The number of records represented by the metarecord are displayed in parenthesis next to the title. The formats contained within the metarecord are displayed under the title. For the metarecord search result, the Place Hold link defaults to a metarecord level hold. Click the Place Hold link. Users who are not logged into their accounts will be directed to the Log in to Your Account screen, where they will enter their username and password. Users who are already logged into their accounts will be directed to the Place Hold screen. Within the Place Hold screen, users can select the multiple formats and/or languages that are available. Selecting multiple formats will not place all of these formats on hold for the user. 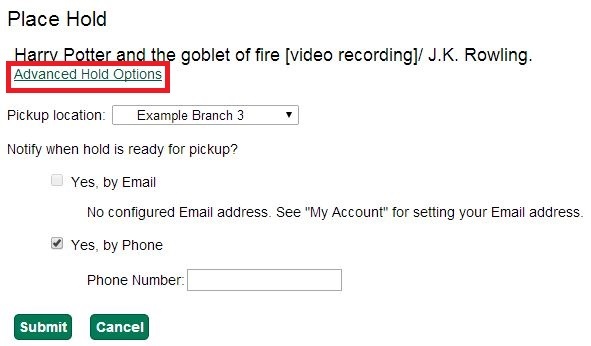 For example, a user cannot select CD Audiobook and Book and expect to place both the CD and book on hold at the same time. Instead, the user is implying that either the CD format or the book format is the acceptable format to fill the hold. If no format is selected, then any of the available formats may be used to fill the hold. The same holds true for selecting multiple languages. When users place a hold on an individual bibliographic record they will see an Advanced Hold Options link within the Place Hold screen. Clicking the Advanced Hold Options link will take the users into the metarecord level hold feature, enabling them to select multiple formats and/or languages. The TPAC now includes a Metarecord Constituent Records page, which displays a listing of the individual bibliographic records grouped within the metarecord. Access the Metarecord Constituent Records page by clicking on the metarecord title on the Search Results page. This will allow the user to view the results for grouped records. Within the staff client, Show Holds on Bib for a metarecord level hold will take the staff member into the Metarecord Constituent Records page. To utilize the metarecord level hold feature, the Global Flag: OPAC Metarecord Hold Formats Attribute must be enabled and its value set at mr_hold_format, which is the system’s default configuration.